Knight Online offers a great free 3D MMORPG experience that features a large player base making it a very attractive option if you are looking for your next MMORPG. 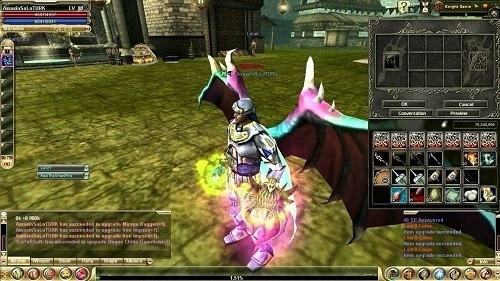 The game original started in Korea but eventually made its way to United States and Europe due to its success in the Asian MMO market. The game requires a game client to be downloaded but if features a fairly small client size compared with similar games. In turn this means that graphic quality is low enough to make it accessible for older computers and laptops. So if graphics are a big deal breaker for you then you’ll probably want to hunt for something elsewhere. Knight Online splits players into two nations which must be selected when you first login to your account. Players can choose to be part of the Karus or El Morad with the option to switch nations appearing later on in the game (at great expense). Similar to World of Warcraft the choice of nation does impact the races that you have available to you. This is mostly an appearance based decision so don’t fuss too much over which nation you want to side with, unless you are starting the game with friends. After you’ve chosen your race you can select a class from several standard options and start your adventure in the Knight Online universe. As you would expect from the genre players advance by earning experience and questing with penalties associated with death. Every level up rewards players with stat and skill points which they can use to improve their character’s power. The focus of Knight Online is definitely on providing a large number of quests for players to complete but lots of time has also been spent developing the party system, bosses and the PvP. Knight Online is definitely a great MMORPG experience and what it lacks in graphics and classes it makes up for with raw content to explore. If you love your questing, PvP and guild battles you will find a place in Knight Online. Small download size makes it accessible for gamers of all types. Great PvP and questing variety. Extensive guild and party options.